SilverStone offers a great variety of both cases and power supply units, but they are nonetheless primarily known for their numerous small form factor cases and non-standard designs. Designs such as these often require very careful consideration of the hardware that will be installed in them, or even special versions of hardware exclusively designed for such systems. We have reviewed a number of their cases in the past, but it is products like the Milo ML04 and ML05 that really stand out when it comes to offbeat, specialized form factors. Meanwhile given their unusual form factor, Silverstone also supplies products like their SFX PSUs and slim optical drives to fit such designs. In fact Silverstone supplies a surprisingly large range of products for their small form factor designs, giving their cases quite a bit more flexibiltiy than one would normally expect. On the PSU side for example, the company currently offers five different SFX form factor PSUs, ranging from 300 to 600 Watts, suitable for driving everything from the true HTPC to portable gaming machines. To that end, today we'll be looking at the most powerful of these SFX PSUs, the SX600-G. The tiny SFX PSU measures just 125mm × 63.5mm × 100mm, or a bit less than half the size of a standard ATX power supply. Yet in that space Silverstone has built a PSU capable of supplying 600 Watts with 80Plus Gold certification and modular cables as well, allowing it to power even the most power-demanding system that could fit in a case that requires such a power supply. We received the SilverStone SX600-G SFX PSU in a relatively small cardboard box, yet large and sturdy enough for the small PSU. The artwork seems a bit excessive, combining abstract and geometric patterns along with a picture of the unit itself. The most basic features of the PSU can be read at the front side of the box and more details are printed on the back. For the most part the SX600-G's included bundle is rather plain, with Silverstone shipping the necessary mounting screws, an AC power cable, and a manual. Unexpected however, SilverStone also provides one extra and rather interesting item alongside with the SX600-G SFX PSU: an SFX to ATX mounting adapter. Our best guess is that SilverStone is also looking to sell this PSU for use in small ATX cases, where space is similarly an issue. However, the very short cables supplied with the PSU are going to be an issue with that concept. This is a fully modular design so every cable can be detached, including the 24-pin ATX cable. 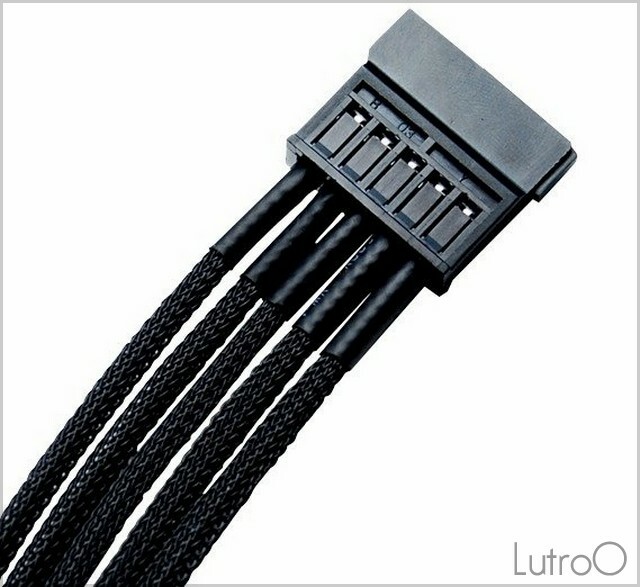 All of the cables are "flat", ribbon-like, including the thick 24-pin ATX cable, with SilverStone apparently aiming to cut down on cable slack and save as much space as possible in the process. Be warned that these cables are much shorter than those of a regular ATX PSU, with the ATX power cable being just 30 cm (11.8") long. Every cable is made by using black wires and black connectors, with the sole exception of the PSU-side connector of the PCI Express power cable, which is blue. Overall the number of connectors is actually very low for a PSU with this high of a power output rating. This means that the SX600-G will typically operate with plenty of headroom, as it would be difficult to completely load down a 600W PSU off of only single high-power video card and CPU.